We welcome back Sara Gray to the club. You can’t fail to admire her empathy with a club audience. 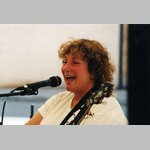 Come and be captivated by her songs, and superb banjo playing. She has a wealth of knowledge to impart about the songs and tunes that crossed the Atlantic to become part of American folklore. Listen out for her stories and humour.